Breakfast of banana pancakes and Vietnamese Coffee before meeting Loc from Saigon Riders for a Ho Chi Minh city tour. We’d looked at all the different Bike Tour company’s in HCM and all of them wanted to charge premium rates to ferry us around on the back of a bike. 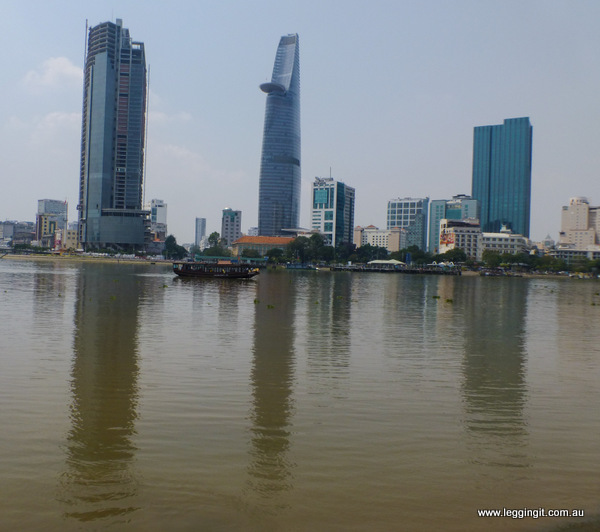 We’ve visited most of the tourist spots in the city so we didn’t really want to go back again so we contacted Saigon Riders and they organised a custom tour. I personally didn’t want to ride on the back of a bike so asked Saigon Riders if we could ride double up on one bike and have a guide on another bike. They were really great coming through with a tour to places we hadn’t been to before. Loc dropped off one bike which was a Honda WH 125, 2008 Model and while he went back to pick up the other one so I took it for a test ride. I started riding down the skinny little alley and out onto the busy street and it handled really beautifully. The bike had been modified for touring with highway pegs, foot boards, leather tank cover, audible turn signal, big rear mudflaps, brake/clutch grips and had a really nice comfy seat and backrest. (Michele was really impressed). Loc soon arrived back, we swapped bikes and I got his 2009 model, and we set off back down the alley out into the traffic. Ho Chi Minh City has legendary traffic and anyone who’s been here will probably agree you break out in a sweat crossing the road but we went straight up to the first roundabout and using other traffic as cover we were through and heading up the road. It was great not having to worry about navigating. All I had to do was keep an eye on the other traffic and stick to Loc’s rear bumper. The Honda handled really well, with great acceleration and it had a nice low centre of gravity so it almost rode itself. We stopped in a market alley not far from the Presidential Palace which was a former shophouse belonging to a Vietcong hero. The former owner led a double life during the war. 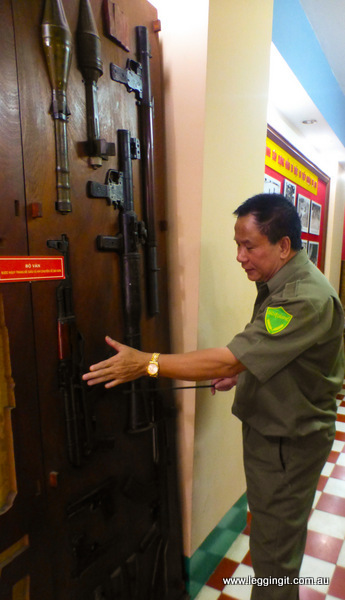 He was a trusted tradesman at the Presidential Palace, but unbeknown to the South Vietnamese Government he had dug a bunker under his two storey house which became a weapons cache with escape tunnels leading to the sewer system. In his roof he accommodated Vietcong guerrillas. During the Tet offensive in 1968 soldiers from his house invaded the Presidential Palace and after a few days some were killed, others captured, tortured and sent to Phu Quoc prison. His house was raided,a policeman and family took ownership of the house never realising that beneath the concrete floor was a weapons cache. These days there’s an old NVA soldier who does tours but as he can’t speak English, Loc did all the translating. There’s lots of old photos of how they smuggled weapons and a special wooden box like a door that housed AK47’s, RPGS’s and grenades. We lifted a small panel in the floor which revealed the secret weapons cache and lowered ourselves through the floor. There were racks of AK47’s, RPG’s, grenades of all sorts, American gas masks, Chinese pistols, machine guns and other bits and pieces in really good order. On the second floor was other bits and pieces and a shrine to Ho Chi Minh. We headed back downstairs thanked the old soldier and after a sugarcane juice we were merging into the traffic again. 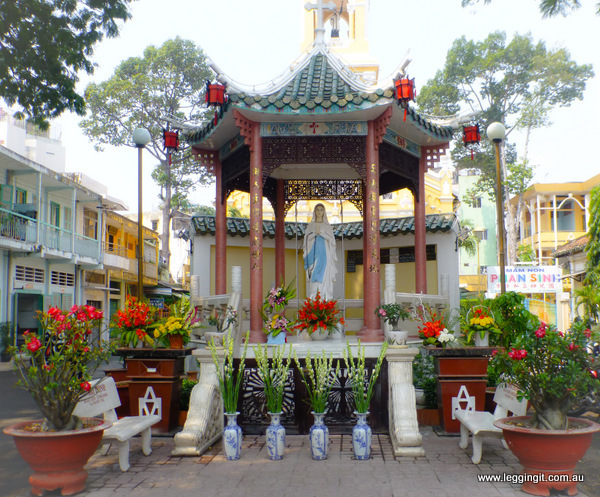 We then stopped at Thiên Hậu Temple, a local temple dedicated to Thiên Hậu, the Lady of the Sea. 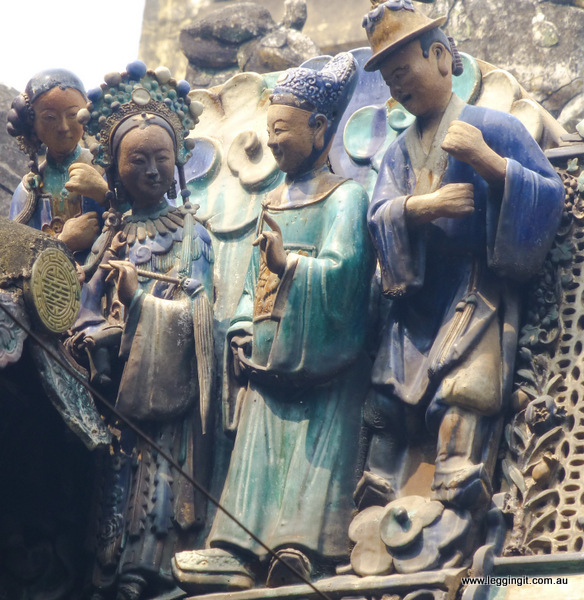 Throughout Asia seafarers have raised temples to worship her and ask for her to keep them safe. 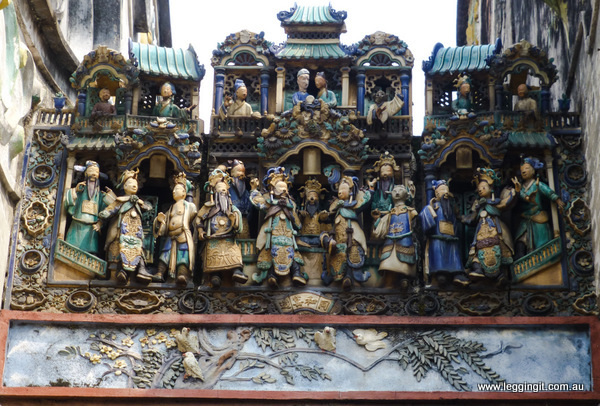 The temple was really ornate with porcelain scenes around the roof, carved wooden statues and panels. There were heaps of prayer coils hanging from the roof slowly smouldering away. They are sort of like big mosquito coils made from incense that you attach your prayer to the top hook and light the bottom of the coil. The temple attendant then uses a long pole to lift it and hang it from wires spanning the ceiling, the smoke carries your prayers to the heavens. We had a prayer for the health of friends and family. We arrived just when a local couple were getting wedding photos taken so asked if we could take some. 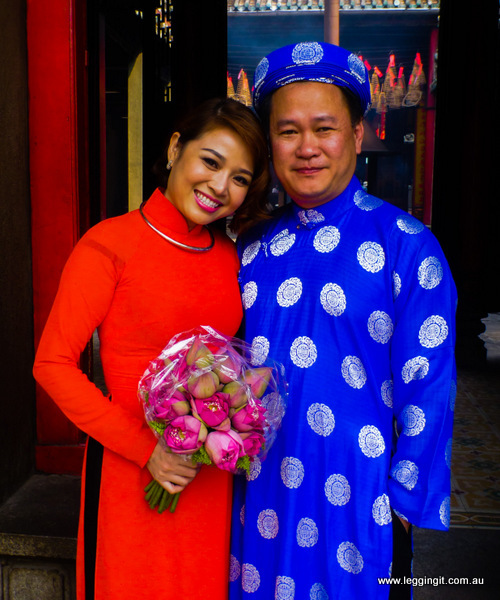 They were dressed in beautiful traditional Chinese silks, he in Blue and she in red. From the temple we cut down back streets and little alleys taking shortcuts and went through a long alleyway which we were told was the largest area for bike parts in Vietnam. If it wasn’t hanging at these shops it didn’t exist. There were all sorts of exhausts, rims, motors, fairings and the shops went on for ever. 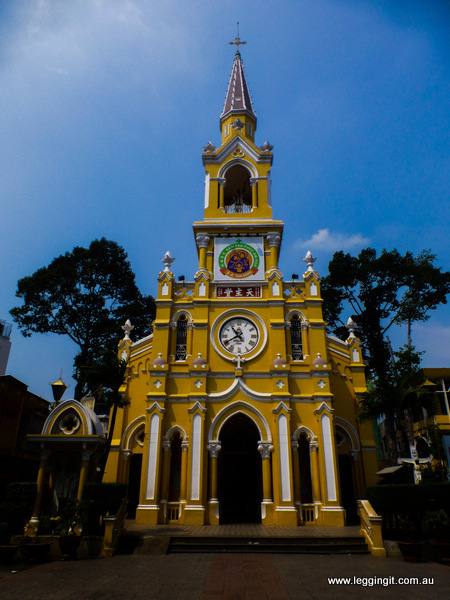 Not long after going through Bike Street we arrived at Cha Tam Catholic Church. It’s a lovely yellow and white building built in the late 1800’s with a mixture of European and Asian inside with Chinese temple drums and porcelain European statues. 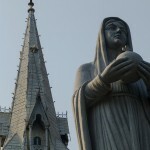 It has a lovely statue of the Madonna in the grounds complete with a round fluorescent tube halo and another which surrounds her like am aura and at night the true effect is best seen. 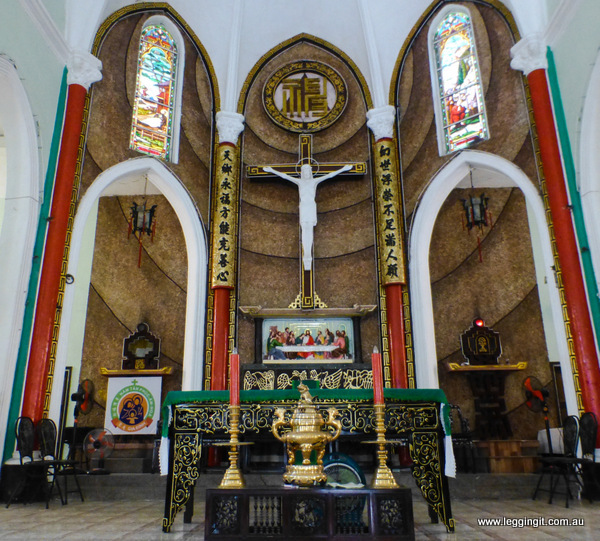 This church was also where President Ngo Dinh Diem and his brother Ngo Dinh Nhu hid on 2 November 1963, after fleeing the Presidential Palace during the coup. Diem and Nhu agreed to surrender unconditionally and revealed where they were hiding. The coup leaders sent an M-113 armoured personnel carrier to the church but on the way back to the palace were shot and stabbed. We continued on to Binh Tay markets. This place is huge with two levels of all sorts of goods selling wholesale. We walked through the cloth, clothing, toys, hardware areas and we didn’t know where at what to look at there were so many stalls. We then walked through the food area and there were all sorts of spices, dried plants, animals, fish. One was even selling dried birds nests, made by swallows with their saliva, which is made into soup. They had other delicacies like dried sea horses and shark fin which was interesting. Back on the road we crossed a few bridges and travelled along a few tiny back alleys to see the disadvantaged parts of Saigon, with shanty houses hanging precariously over the river. 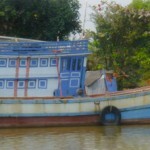 Shanty’s made of corrugated iron and wood perched on stilts. 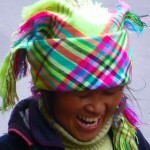 Whilst the Vietnamese economy has been evolving not everyone has been able to take advantage of if. With the downturn and slowing of exports who knows what the knock on effect will be. 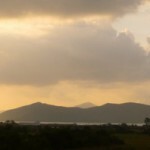 Vietnam is home to big motorbike factories of Honda, Yamaha, Piaggio, Sym, Suzuki and depend on exports to the rest of Asia. The last year the manufacturers sold 600,000 less bikes and who knows how this year will go with everyone tightening their belts. 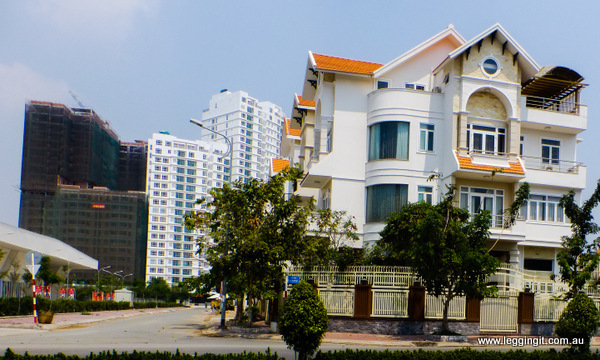 After the hustle and bustle of the city and surrounds we ventured into what’s known locally as Beverley Hills where the more affluent Vietnamese and expats live. Wide tree lined boulevards with luxury condominiums and absolutely no traffic. The parks and gardens were also the scenes for lots of wedding photos with brides, grooms and their photographers vying for the perfect shot. 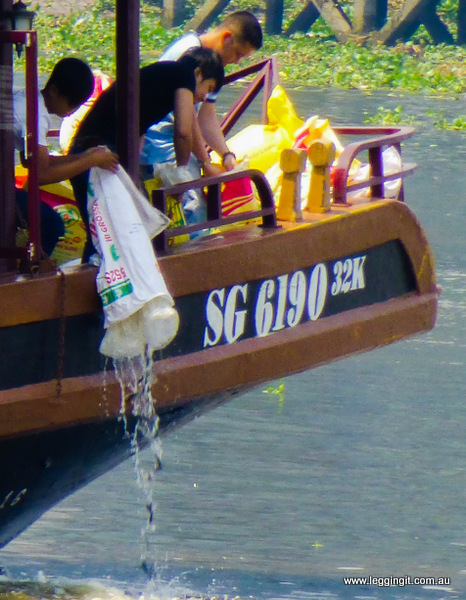 We crossed over the Saigon River via the Phu My bridge and we raced a truck loaded high with goods waving to the driver. 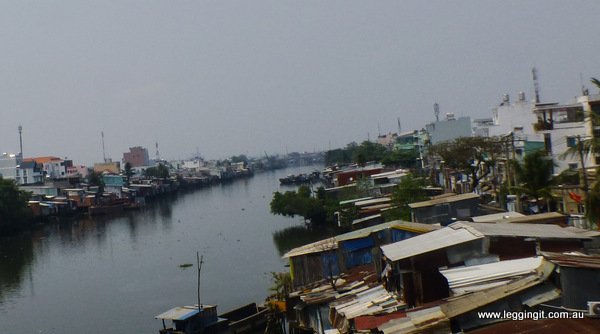 We stopped overlooking the Song Saigon river, with floating restaurants and the high rises of the central business district beyond. We backtracked along a one way street with someone suggesting we were going the wrong way and entered the Saigon River tunnel which crosses beneath the Song Saigon. The tunnel led us back close to the hotel and soon we were saying goodbye and thanking Loc for a wonderful day. 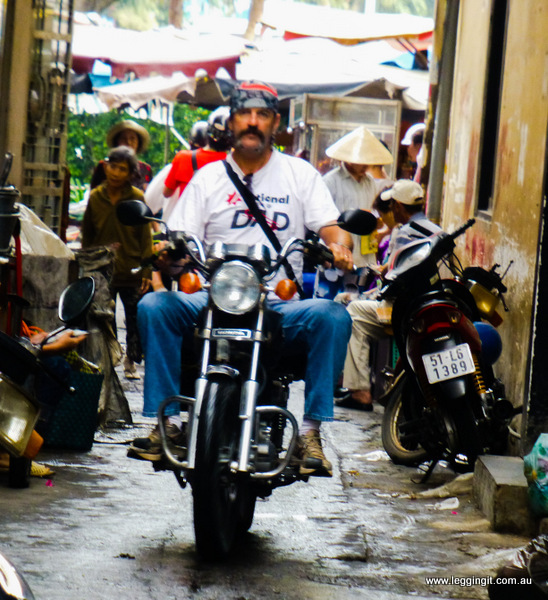 We motorbiked in many places in Southeast Asia, but as we haven’t got to Vietnam, everyone says we missed the craziest place in that sense, Saigon. 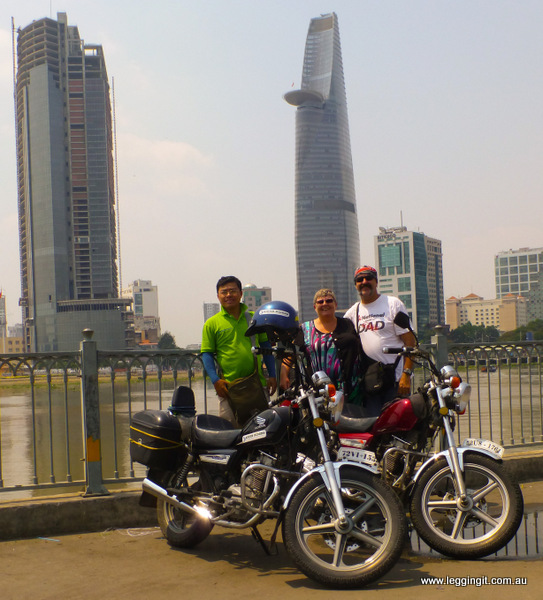 I really envy your experience with the Saigon Riders, it seems to be an awesome experience!! It definitely was a great way to do it not having to navigate our way around made it much easier in such a busy city. What an interesting story about that former shophouse… sounds so secretive and like from another world. Quite a piece of history! And how about Beverly Hills in the middle of Hồ Chí Minh?! Beautiful photos. Yes it sure made us realise the huge lifestyle differences in the city. How cool is this! It’s certainly got an ‘easy riders’ type of feel to it. There’s always such a different side to see in a country or even a city when you hop on two wheels and start peddling (sorry, motoring I mean) around. Great experience to share, you’ve certainly sparked a rumbling desire to get on a bike, it’s been too long. It sure does give you a different perspective, I hope you get out there on a bike soon. Cool adventure! Sounds like you guys had a lot of fun. I know what you mean about the traffic in Ho Chi Minh City – I felt like every time I tried to cross the road I was taking my life into my own hands! It takes a bit of getting used to at first we walked with locals until we became used to it. What a great way to explore a city!! I recall going to Benidorm and renting mopeds (ok, not the same as motorcycles I know but similar!) and it was an awesome way to just cruise around and explore all the hidden off the beaten path spots. 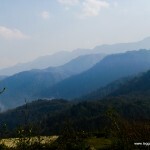 This post is yet another reason why I am leaning towards wanting to explore Asia. 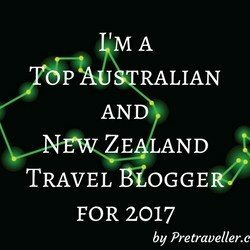 For a long time, Asia was one of those spots in the world that never really appealed but the more I read travel blogs, the more I am becoming convinced I need to experience it for myself. 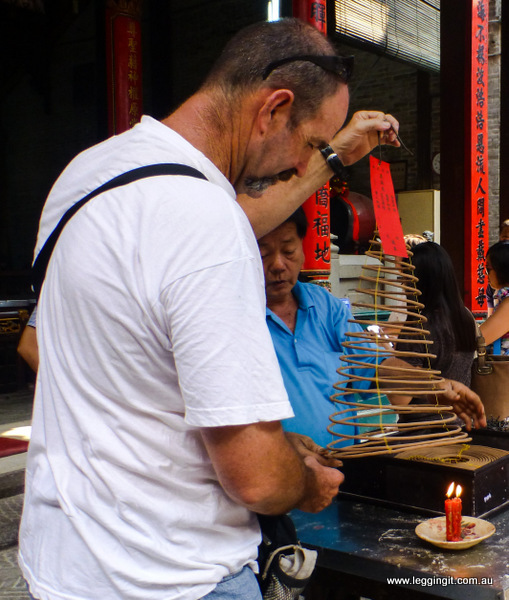 Asia is great as it really confronts your own culture and makes you realise how lucky you are. The people are so friendly although it can be overwhelming at first as they are always asking you to buy something but you get used to it….and the food is amazing. What a NEAT thing to do. Sure beats walking and I wanna look cool while riding that bike!!! Your whole day sounds fabulous!! It is great to hear a positive story about Vietnam too, as I have a very dim view of being a tourist in the country after my own trip there. That is sad Sharon as we have never had an issue. I hope you get the chance to return one day and give it another go. I’ve dreamed of riding through Vietnam. This makes me even more anxious. 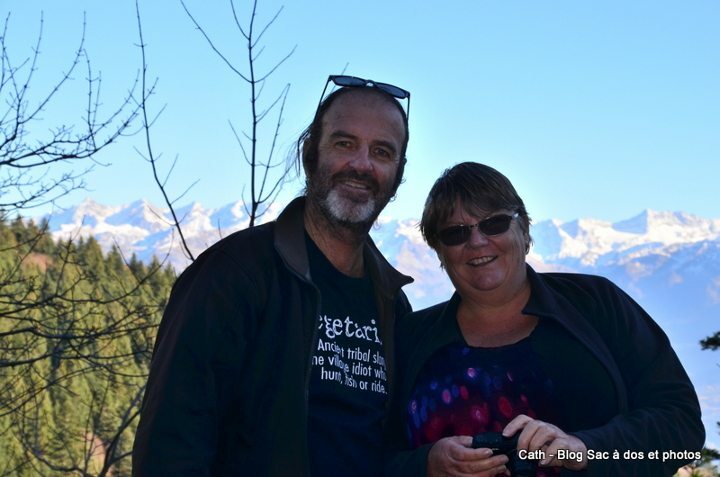 We rode our Harley around Nova Scotia about 6 years ago and it is such a great way to travel! You feel so in touch with everything and people seem to be so much friendlier. No barriers between you and the countryside/ people. Looks like a lovely time. 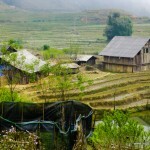 It is great to ride on 2 wheels while traveling in Vietnam and get into the real discovery that bus, van can not touch.